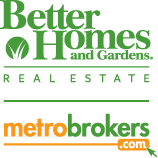 As a Realtor® for Better Homes and Gardens Real Estate Metro Brokers, it’s my goal to find buyers the perfect home, or negotiate the best offer for my seller’s. Using the latest state-of-the-art sales and marketing technologies always saves my buyers time and unnecessary expenditure. My sellers benefit from a powerful web presence, including professional photography, customized brochures and HD virtual tours that will give your home the exposure it deserves to stand out from the competition. My ultimate goal is to serve the best interest of my client, always being accessible and quick to respond. With my drive for success and years of experience I will accomplish your real estate dreams. So if you are buying or selling let me unite my experience and extraordinary service with your desire to find an extraordinary home. Our luxury offering, Distinctive Collection, offers concierge services and market experience you’d expect from a luxury brand whose legacy was built upon those with distinctive taste. When you’re Buying or Selling an exceptional property, you expect a level of service from a Real Estate professional that is as singular and distinct as your position in the marketplace. The BHGRE Distinctive Collection is a unique luxury brand designed to deliver on your expectations for the highest levels of Real Estate service and innovation. Distinctive Collection luxury properties typically fall in the top 10% of the local market’s price range, meaning they’re the most exclusive properties available in the area. In many of our markets the Distinctive Collection begins in the million dollar price range, and the sky’s the limit! All Distinctive Collection properties receive top notch marketing, exceptional service and exclusive listing priority on the BHGRE Distinctive Collection website, DreamHomes.com.